FREE DRIVER MOBILE APP, ALSO FOR PILOTS & MARINERS! Find a DOT Physical Exam Near You and Never Forget to Renew Your Certificate! The perfect solution to an unexpected expired certificate whether you are at home or away. Search using your GPS location or by city, state or zip code. View the services available at that clinic (may include pricing). Call the clinic or get directions with a single tap! Never Forget to Renew Your Medical Certificate! Get “Expiration Alerts” sent to your email and mobile device starting two months before your current certificate expires. Alerts continue until one month after your current certificate expires. Save the expiration date of your new certificate and the process resets. Have plenty of time to prepare for your next medical exam. Save the location of your last medical examiner and the alerts contain your medical examiner contact information. Don’t ever forget to get a new medical certificate again. The easy solution for a lost or expired certificate, or to ask questions about medical conditons or medication changes. Save the contact information of your medical examiner and calling their office is right at you finger tip! 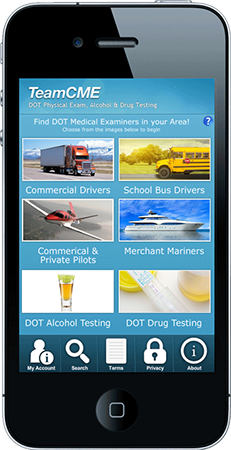 Download DOT Physical Exam Locations, Convenience and “Peace of Mind” for Free! That’s right, Free for Iphone and Android Mobile Devices! Download from the Apple App Store or Google Play. Just search for “TeamCME”. OOIDA Members: Get the OOIDA Discount on your next DOT Physical Exam! If you’re an OOIDA member, save 10% off of your next DOT Physical Exam by going to a TeamCME/OOIDA participating location. Finding a participating location near you has never been easier! OOIDA Members: The TeamCME Mobile App is the perfect way to find a participating clinic to get your OOIDA member discount on CDL Physicals! App available for Android phones and iPhones. Click on the icon below to download the Full Featured version today or search for DOT physical on the Apple App Store or Goggle Play.